Look, the sun is out! We’ve been soaking it up. In between laying out slip n’ slides and trips to the beach I’ve managed a teensy tiny bit of sewing. Last year I made a few little quilts tops to be donated…and then they’ve sat waiting to be finished. I looked at them this week and realized I better get them done so someone can love them. They are finished super simple…but better done than fancy right? The pattern is Suburbs…modified to be a large crib size. I did super simple quilting around the seams, then bound it using the quilt back with this method (so fast!). What a great view you have! It's been in the 100's here. 70's sounds like sweater weather. Your quilts came out sweet. I hope you don't mind me asking, but where do you live? The view is fantastic. Is it your home or are you on holiday? The kids look happy in the pool. Love the quilt too. Lovely quilt and sensational view!! LOVE your house block quilt. I do like how there are gaps in the rows of little houses, lovely quilt and the tutorial I had forgotten about so good to be reminded how to do the binding that way. Kids look to be enjoying their warm water! You sure live in a pretty area!! Wish the summer sun would shine on us!! Sweet pic of the kids. I don't like cold water, either! Your quilt looks beautiful. I love theese houses. I just found out you wrote a book with a house pattern in it. Gotta have it. Lucky me I can order it over here. Sounds like you're having a wonderful summer! Love the view also and your kids are just too sweet! :) Your quilt is adorable! Great quilt ! And such a fantastic view ! 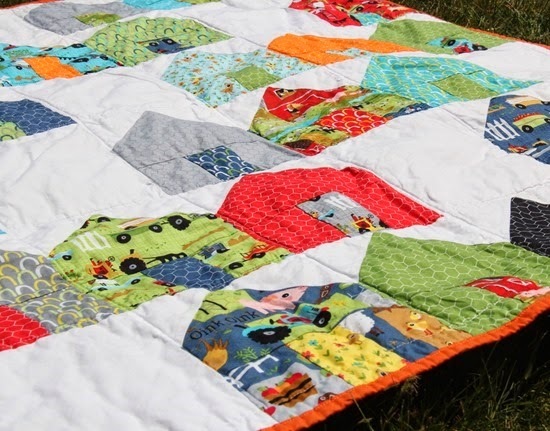 cute, cute quilt – someone will feel the love in that one! Your kiddos are darling! Love the scenery! I just downloaded this Suburbs pattern because I fell in instant love. Thank you for sharing all your great creativity!!! What a cute quilt! Love all the great colors. Aw, such an adorable quilt, and WHAT a setting!! I had that exact same pool for my girls when they were that age…20 years ago, egad!! What a great pattern, with very clear instructions!! I'll let you know once it's quilted! I love that pattern–made it for my daughter as a housewarming present. Thanks for sharing the view. 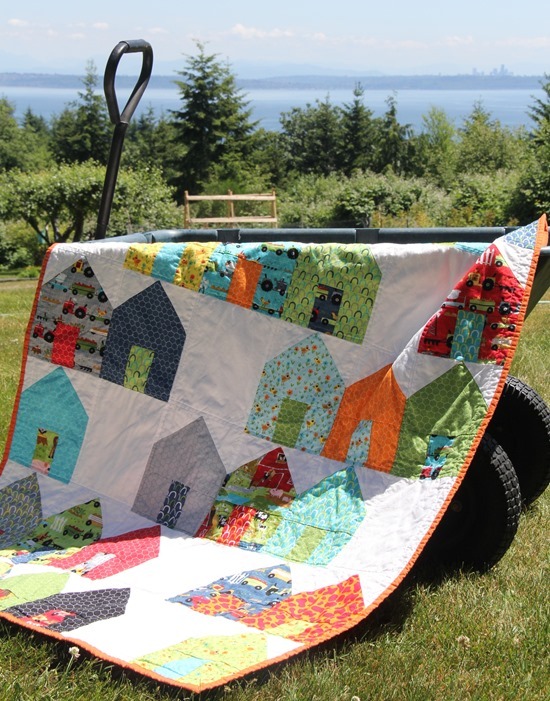 Love love the house blocks and the great fabrics you used. Isn't pool time great? I remember carrying buckets of hot water to add to the pool too. Love your quilt pattern. I recognise your fabrics – Moda Oink-a-doodle-doo. 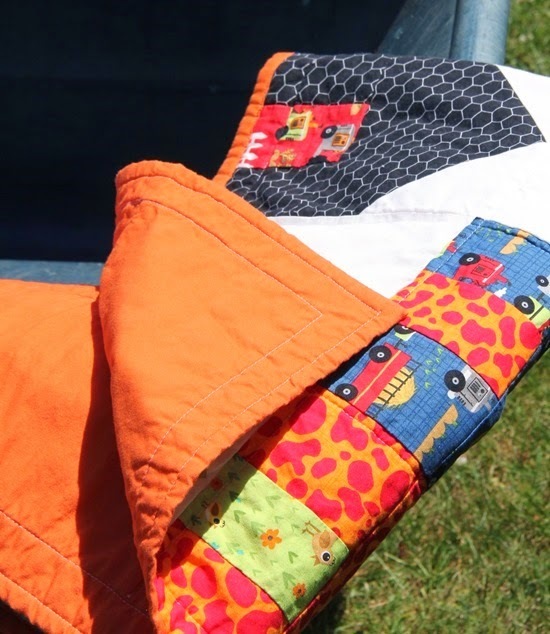 I recently made a little quilt for our newst family member using a charm pack of this fabric – it's so bright & happy!